Note from author: I would like to acknowledge the assistance of Ed Chaney, Deputy Director of the MAC Lab and Dr. Julia A. King, St. Mary’s College of Maryland in the preparation of this blog. Any errors are my own. Figure 1. Tulip shaped tobacco pipe from the Pine Bluff site. Tobacco had social and spiritual significance for native peoples and in some cultures, stone pipes were used in treaty ceremonies. 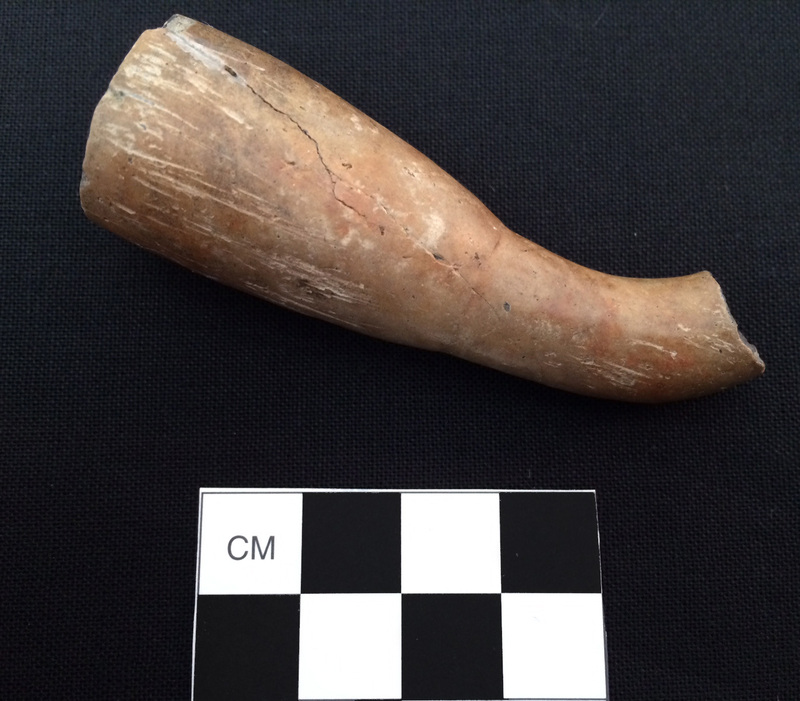 This week’s Maryland artifact is a tobacco pipe recovered in the 1970s during an excavation at the Pine Bluff site (18WC20) near modern-day Salisbury in Wicomico County. The pipe, made from fired clay, is in a shape associated with the Susquehannock Indians and often described as a “tulip” pipe. Other materials found during the excavation, including gun parts, glass pharmaceutical bottle fragments and English ceramics, suggest that some components of this possible village site post-dated English contact (Marshall 1977). Figure 1. 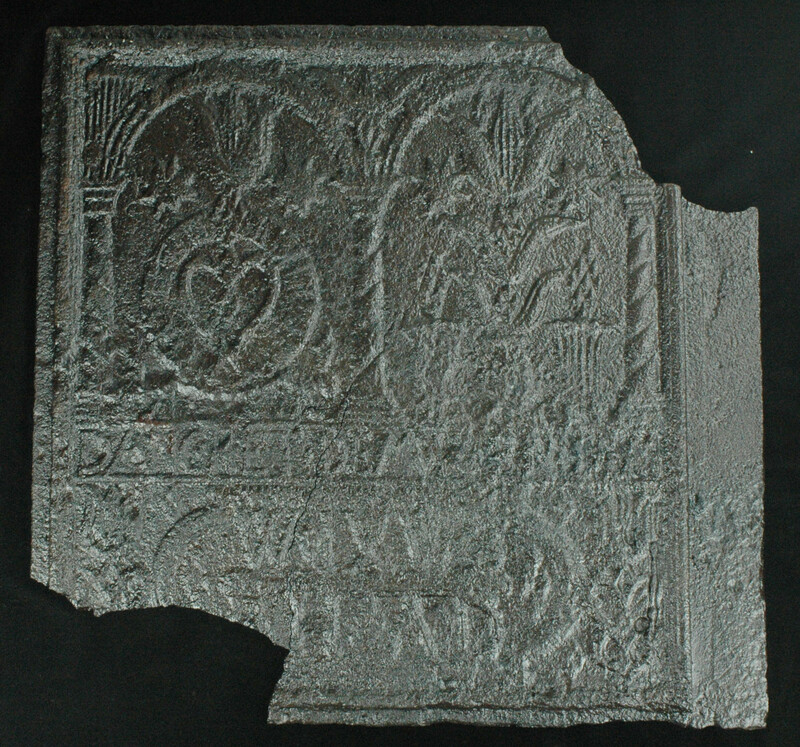 Complete wine bottle from the King’s Reach site. As the days grow longer and the weather warmer (finally! ), my thoughts begin to turn to a nice glass of Chardonnay or Pinot Grigio. And how lucky we are to have Perigeaux Vineyards and Winery right up the road from us at Jefferson Patterson Park and Museum-a nice Friday happy hour venue! Sales of Maryland wines totaled over 24 million dollars in fiscal year 2011 (Maryland Wine 2014) and the industry continues to grow. 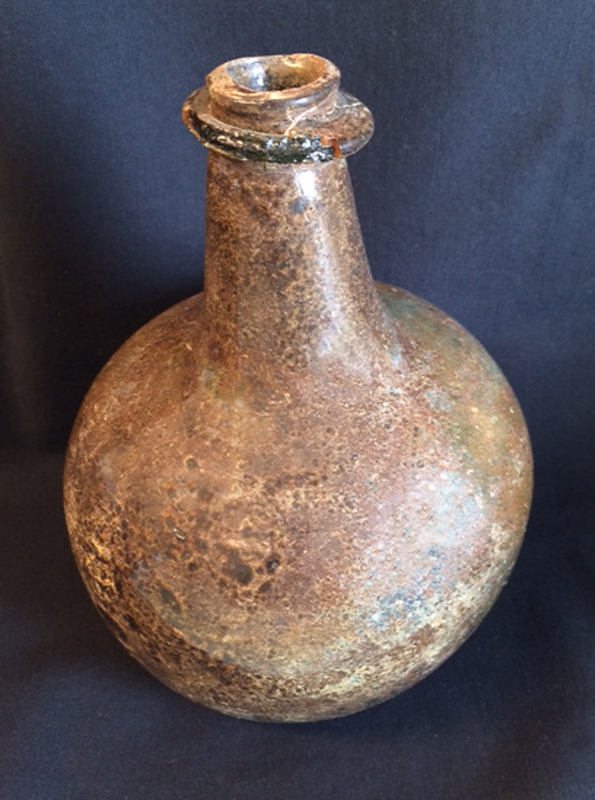 The late 17th-century wine bottle shown here was recovered at the King’s Reach plantation site (18CV83) in Calvert County, today home to at least five wineries. The modern production of wine in Maryland can be dated back to 1945, when Philip Wagner opened Maryland’s first winery, Boordy Vineyards, in Baltimore County (Appellation America 2014).